A liquid crystal display (LCD) is an electro-optical amplitude modulator realized as a thin, flat display device made up of any number of color or monochrome pixels arrayed in front of a light source or reflector. It is often utilized in battery- powered electronic devices because it uses very small amounts of electric power. A Marine LCD Display (LCD) is a Marine Display dedicated to displaying data relevant to the function of marine electronics on the vessel. 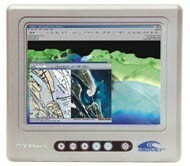 Examples of Marine LCD Displays include RADAR, Chartplotters, Remote Displays, and FishFinders. Furuno MU150HD Marine Monitor, 15"
Furuno MU190HD Marine Monitor, 19"